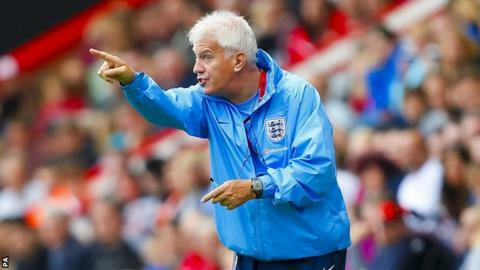 England interim coach Brent Hills says he is not getting carried away after his side beat Belarus 6-0 in their opening 2015 World Cup qualifier. A Karen Carney hat-trick and goals from Ellen White, Natasha Dowie and Eni Aluko made sure England got off to a winning start in Bournemouth. "One swallow doesn't make a summer," said Hills, who is hoping to land the job on a permanent basis. "We're pleased about things we worked on in training and tried in the game." The Belarus game was England's first since former manager Hope Powell was sacked in August after a miserable European Championship campaign in Sweden - and they marked it with a first six-goal tally since a 6-0 win in the European Championship qualifier against Croatia in March 2012. "It didn't go well all the time but they had a go," Hills added. "We did our research on Belarus but I wanted to see us pressing as a team to win the ball back earlier. "Finishing is difficult for everyone, but we scored some good goals so I'm not displeased at all. "The early goal from Karen gave us some composure and settled our nerves so it was a good day for us." England, who have not lost a qualifier since 2002, also face Wales, Montenegro, Ukraine and Turkey in their group.